If I were to speculate, I’ve probably eaten around 250 Pop-Tarts in my lifetime. And not the kind with the baby zebra on the box with no sugar added, whole fruit, wheat crust, and no frosting. WHO EATS A POP-TART SANS FROSTING? That’s what I wanna know. No, the kind I consumed were of the brown sugar cinnamon, strawberry, cherry, or wild berry variety with the purple frosting with blue swishes across the front. My mom would toast two up, slather them in I Can’t Believe It’s Not Butter, and carry them downstairs to me, where I’d inhale bites between strokes of mascara and lip gloss before school. Now THAT’S how you eat a Pop-Tart, kids. That is, unless you’ve turned a new leaf and no longer consume high fructose corn syrup, blue lake dye, and hydrogenated oils. See where I’m going with this? Yes, healthy Pop-Tarts. That’s what we have here. I’ve tried to make Pop-Tarts before with Greek yogurt or whole wheat flour in the crust to slash calories, but let’s be honest: They tasted like sand. So this time, I wised up. 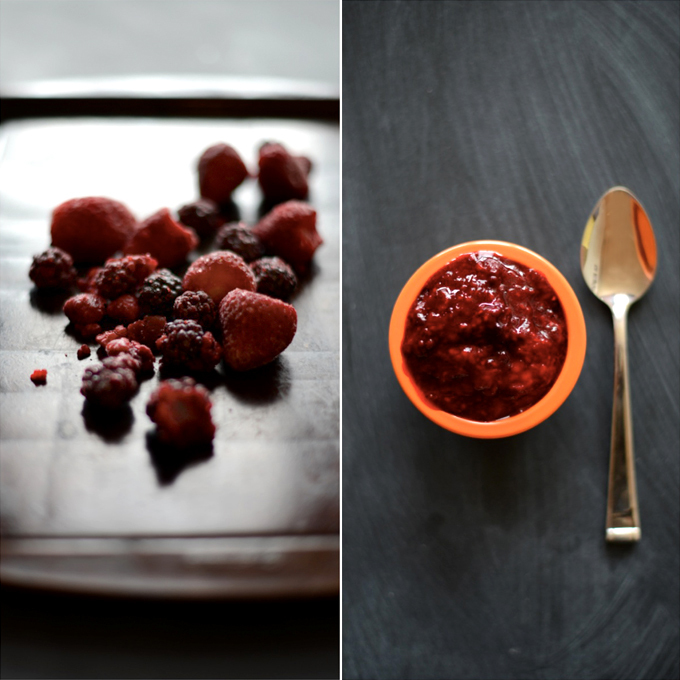 I used Earth Balance and whole-wheat pastry flour and kept my fillings as simple as can be – pure fruit compote. Friends, we have a winner. These glories are vegan and fairly simple to throw together, requiring just 7 ingredients and about 45 minutes of your precious, precious time. After all, who would actually make Pop-Tarts if they took 5 hours to prepare? Not I, and neither should you. You deserve better than that. We deserve better than that. 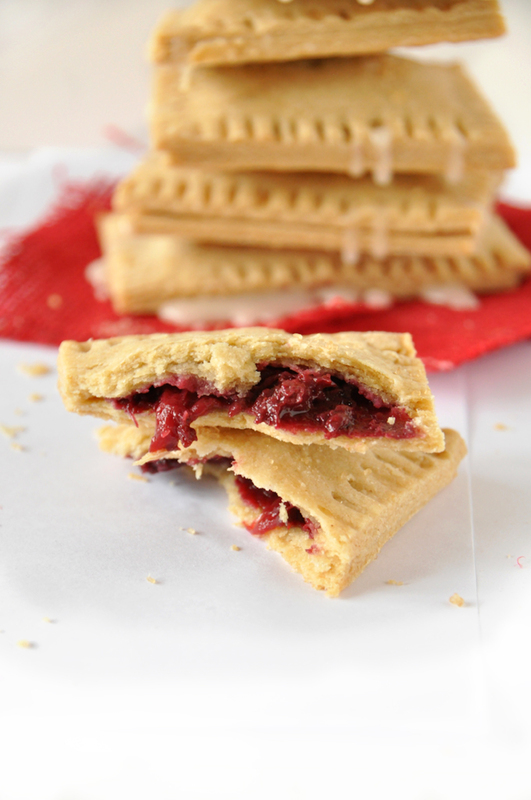 You will love these Pop-Tarts. The crust is flaky and buttery (despite using vegan butter). The filling is tender, fruity and naturally sweet. The raw sugar on top provides a delightful crunch. And the optional vegan vanilla glaze sends me straight back to my childhood, sans GMOs. Gah, life is good again, thanks to healthified Pop-Tarts. 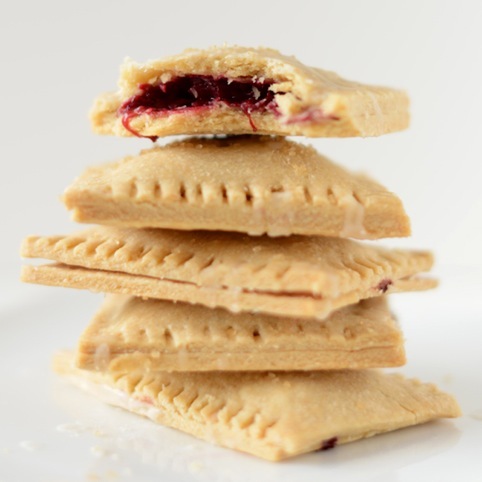 Flaky vegan Pop-Tarts with a berry filling, raw sugar topping, and an optional vanilla glaze. 100% vegan and healthy enough for an indulgent weekend or weekday breakfast. Preheat oven to 375 degrees F (190 C) and line a baking sheet with parchment paper. Prepare the compote by placing berries in a small saucepan over medium heat. Cook for 5-8 minutes with a lid on, stirring occasionally and smashing down with a spoon. Add a few teaspoons of sugar to sweeten if desired. I added 1 tsp. raw sugar (amount as original recipe is written). Transfer to a bowl to cool. To prepare crust, mix flour and salt in a large bowl, then cut in butter with a fork or pastry cutter until well combined. 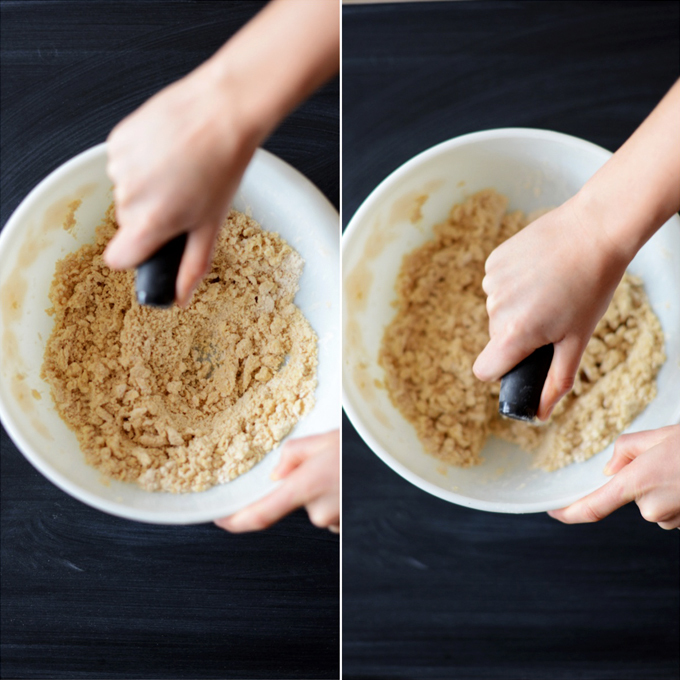 Using a tablespoon, drizzle cold water over the mixture and mix with a wooden spoon until it starts to form a dough. I added 2-3 Tbsp - you may need to add up to 5 Tbsp (as original recipe is written // adjust if altering batch size). It should be moist enough to form into a ball, but not too sticky to knead. Add more flour if it gets too wet. Turn onto a floured surface, shape into a disc, and then use a rolling pin to roll into a large rectangle. I find it helpful to place a sheet of plastic wrap over the dough while rolling to reduce cracking. 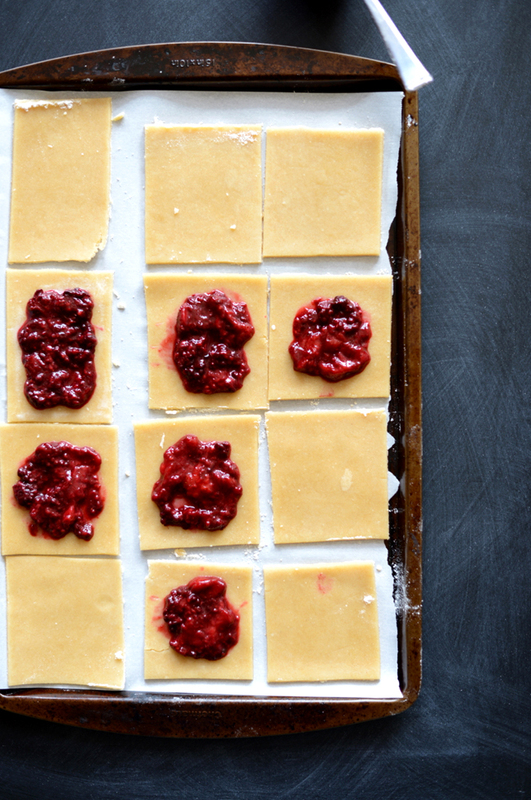 Cut into 12 equal squares (not rectangles) and carefully transfer each to the baking sheet (amount as original recipe is written // adjust if altering batch size). Place about 1 Tbsp of filling onto half of the squares (6 as original recipe is written), leaving a 1/4 inch border to seal the edges. Then use your finger to dot water around the edges so the two squares stick together. 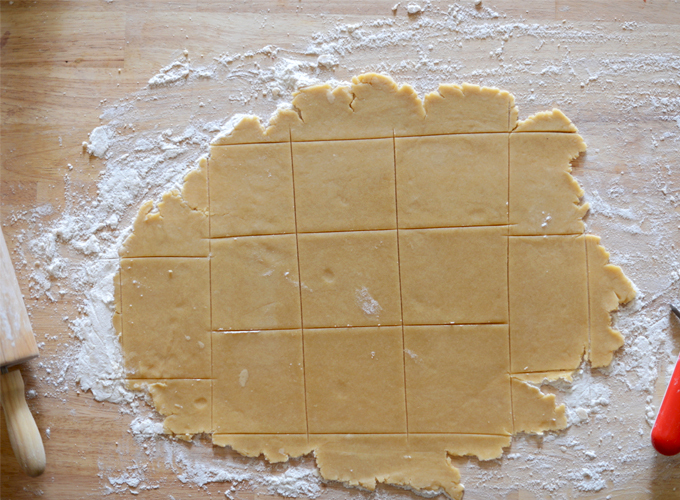 Top the squares with their matching halves and then seal lightly with a fork. Poke a few holes in the top of each, rub a tiny bit of vegan butter on top of each, sprinkle with raw sugar, and bake for 20-25 minutes or until golden brown. Let cool for a few minutes. Then top with glaze if desired. Not necessary, but recommended for sweeter Pop-Tarts. I hope this isn’t blasphemy but I made with real butter… turned out great! Used a combination of frozen strawberries and raspberries. Also, accidentally only made 4, very large tarts! Still awesome. Just made these yesterday and they were amazing! Thank you so much for this, my hubby and I used to enjoy indulging in pop tarts from time to time, but I always felt gross from all the chemicals and sugar I was dumping in my body, these are wonderful because I can feel good about eating them now (well in moderation haha). Do you think I could substitute applesauce in place off butter? Or will it affect the end result? We haven’t tried and can’t say for sure, but let us know if you experiment with it! Good luck! These were so simple to make & turned out great! I used fresh raspberries & didn’t experience any negative effects doing that instead of frozen. Perfect weekend food. ? Does this need frozen fruit or would fresh work? I think fresh would work! I’m definitely going to try these one of these days – like you, I can’t have dairy anymore, nor do I prefer regular pop tarts (because they have all those nasty ingredients in there), so I’m pretty dang excited to try an alternative! I bet these would look so cute with beet-dyed frosting and rainbow sprinkles, though the way you did them with the glaze also looks lovely. The email is on the way ;) We hope you love the recipe, Naty! YUM! I just made these gluten-free with Pamela’s baking mix + almond meal–a bit hard to roll out but I did it! sooooooo good. Thank you SO much!! (all your recipes are incredible). xo. Is there a way to make this gluten free? Hi Lindsay! I’d try our gluten free blend! Hope that helps! We filled ours with homemade strawberry jam. While I thought they were tasty, it was also a little overly sweet. Next time we have some fruit, I’d love to try the compote. What’s the best way to store these if any make it past the morning? I tried this recipe step by step, and it turned out great. I served this as the dessert to a weekly potluck dinner. I recommend toasting them right before serving. The recipe Dana provides made exactly 6 pop-tarts. It’s the perfect amount to try a new recipe, and enough for a small dinner party. Both my family (who is skeptical of any recipe with the word “vegan” in it), and my friend (who actually is vegan) approved! Mixing whole wheat flour with all-purpose flour was a great idea. The best of both worlds! I tried a few different fresh fruit compotes. In a separate posting (https://minimalistbaker.com/simple-berry-compote/) Dana recommended adding ginger to a berry compote. This was a yummy suggestion! I made a batch this last weekend, and I was really disappointed that after eating nothing but vegan pop tarts for breakfast, lunch, and dinner, I didn’t have anymore. I think if you could tweak the recipe to create an endless supply, it would be perfect. In all seriousness though, these were ahh-mazing. I am really excited to try different fillings, particularly to recreate s’mores, as s’mores pop tarts represented approximately 33% of my diet as a kid (the other 66% being Sunny D, ramen, Mountain Dew, and snickers bars. It’s a wonder I’ve made it this far in life). Thank you for yet another fun, easy, delicious recipe! ? Delicious! Kid approved. The only changes I made were I only used all purpose flour, and I used organic strawberry fruit preserves to fill. I first have to say “I do” to your question of who eats a pop-tart without icing. I was thrilled when, for an oh-so-brief-time, an un-frosted, whole grain version of Pop Tarts was on the store shelves. They even made one with oats!! Oh how I loved those. I still weep for them at night. Ok, not really weep; yearning though. But seriously, thank you for this amazing recipe. I have some fresh blackberries just begging to be pop tart filling. Can you hear them too? I am very excited to try this recipe in the coming days. I just made these, they are great and very versatile. Where is the recipe for the vanilla glaze? I couldn’t find it. I used vegan butter I made from a recipe from “The Vegan Pantry” and it worked perfectly. I did have to add at least twice as much water as called for in the crust. I will be making these again, thanks! Awesome recipe! What do you think the shelf life is on these? I’m thinking of shipping them to my grandma. Do you think you can freeze some of he dough instead of making it all at once? I am going to try a gf dough. I hope it works out! I made these about a month ago with pleasant surprise of how delicious they were! I loved them and so did Hubs and toddler! Yay! I want to make them for a get together this weekend and have tons going on. Could I make these and freeze to bake off later from the raw point? Just curious if they’d hold up and not get too soggy or chewy. Thanks for another great recipe!!! Hi John and Dana! 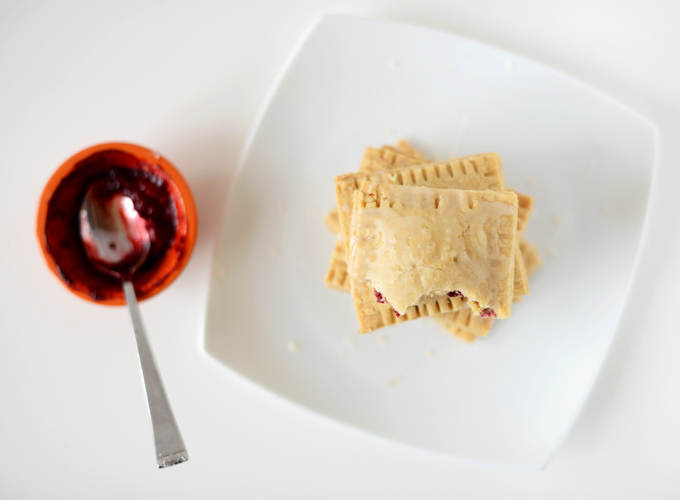 I am so excited to share your recipe for pop tarts on my blog (with full credit to you ofcourse!) and show photos of my three year old making them with me. I am about to post it, but I want to make sure it’s alright with you! Hi Dana! I absolutely LOVE your recipes! I was wondering if you had any ideas on how I could make a brown sugar cinnamon filling. Do you think this would work with gluten free flour? I LOVE pop tarts!!! I ate these constantly, even into adulthood, ignoring the obvious grocery list of scariness on the ingredient label. One celiac diagnosis later, I had sort of given up on ever eating anything lovely ever again (I like my bread y’all, and isn’t the best most comforting stuff ALWAYS bread?) so I adapted your super easy recipe to be GF vegan. Just replace the flour with a GF bread dough mix (I used Bob’s Red Mill, because it has Xanthan gum already mixed in for elasticity) I used a touch of blackstrap molasses instead of the sugar in the filling, and they are simply heavenly. Thanks Dana for the scrumdiddlyumptious sans-death pop-tart recipe. This saved my life. wow these are delicious!! I used fresh strawberries instead of frozen and they turned out wonderful. Thank you!! turned out delicious but I needed a LOT more than 5 tbs of water, probably 3-4x that! but sooooo good! The glaze recipe link no longer works, it goes to an apple streusel recipe. FYI/can you fix, please? Thanks! Can I make them the night before and bake them in the morning? So… can I put them in a toaster for later enjoyment or would I have to reheat them in the oven? Could the dough be made the night before and chilled overnight, then assembled the next morning? Or do you think you could assemble the whole thing the night before then bake the next morning after letting them rest on the counter to come to room temp a bit? My dough came out super stiff and as a result it was really hard to roll them out thin enough, which made for thickish, dense edges that were not too good. I did substitute cold apple juice for the water, and added a little agave to the dough but doubt that is the culprit. Did anyone else have this experience? Know what could have gone wrong? How can I get a nice flaky crust instead? Yeah these look good, but 330 calories and 18g of fat each?? Yikes! I’d need at least 2 to consider it a good bfast option. That’s 660 and 36g of fat for bfast. Good idea, but they need a skinny version. This is definitely an indulgent breakfast option, but I do still like that’s it’s homemade and has no strange preservatives. If I were eating one, I’d treat it as a snack in the afternoon, or in the morning alongside a smoothie or some fruit. Hope that helps! Someone may have said this already but if you are using all-purpose flour, these are not likely to be GMO free. Okay, it’s almost kind of awkward that I’m using so many of your recipes, but they all seem perfect for my family, and I love that you don’t use crazy ingredients. My children accompanied me to the grocery store this evening (to my dismay.) Well, I zigged when I should have zagged and they saw the, seemingly half aisle, selection of pop tarts and they started foaming at the mouth. I remembered seeing your recipe so I confidently promised I would make them and we headed over to the frozen berries to pick out their desired berry combination. Well, I did it!! And it was pretty darn easy except mine didn’t turn out quite as pretty as yours. Both kids loved them and said they don’t want the other ones (sigh of relief). It may be sugary, but I am using non-gmo, mostly organic ingredients and no preservatives! Sorry for the late response, Stacie! SO glad you made this recipe and enjoyed it so much. It’s such a great homemade treat that’s WAY healthier store bought versions. Thanks for sharing. Cheers! Just started reading your blog and you have the BEST sense of humor. Looking forward to making these for my little one. Hi! Absolutely love your blog! Your recipes are amazing! One quick question, could solid coconut oil replace the vegan butter? Thank you! Yes, I believe so! It may affect the flavor and texture a bit, but it should work! Hope that helps. Made these for the kids. . they were great. Did have to substitute some ingredients like real butter but they turned out awesome. Made then slightly smaller and we served them as a sweet treat with scrambled eggs and bacon while we were on Christmas vacation. They were a hit! I haven’t! But I assume they would reheat well in the toaster. Do you think garbanzo bean, tapioca or almond flour would work? Food allergies! I don’t think a bean flour would work hear, not would an almond flour on its own. I’d try my gluten free blend. Hope that helps! I tried both coconut and almond and they didn’t work, wound up in the garbage. Just go for the whole wheat or regular flour and save yourself the aggravation. Do you think white whole wheat flour could be used? Yes! I think that’d work well. Can I make these ahead and freeze them? What if I use jam instead of frozen berries? Thanks! I think so but I think they’d be best fresh. You can sub jam but make sure it’s high quality, such as strawberry preserves. Hope that helps! Oh hooray! It is so hard to find good to-go snacks for my allergic toddler. We’ve been buying Nature’s Own pop tarts (he can have the unglazed strawberry and blueberry) but that gets expensive. This is wonderful, I’m so excited to try it! Just made these and inhaled one! The crust is great! Not sweet, but flaky… Sooo good with the glaze and I should have did a better job sprinkling sugar on top. So worth the time! I hope my boys love them! THANKS!!! Just found your website and I just texted all my friends about my new obsession minimalist baker.com! Can’t wait to start baking my boyfriend some tasty healthy treats. Thank you!!! Pop tarts take me way back to my childhood too – my mom would not often agree with me putting a box in the cart at the grocery store, but every so often, she would succumb to my pleas. My favorite flavor then was S’mores, but my grown-up taste buds are seriously having a freak-out thinking about these berry pop tarts. These will definitely be happening in my kitchen soon! Beautiful photos! These look amazing! These look so amazing! 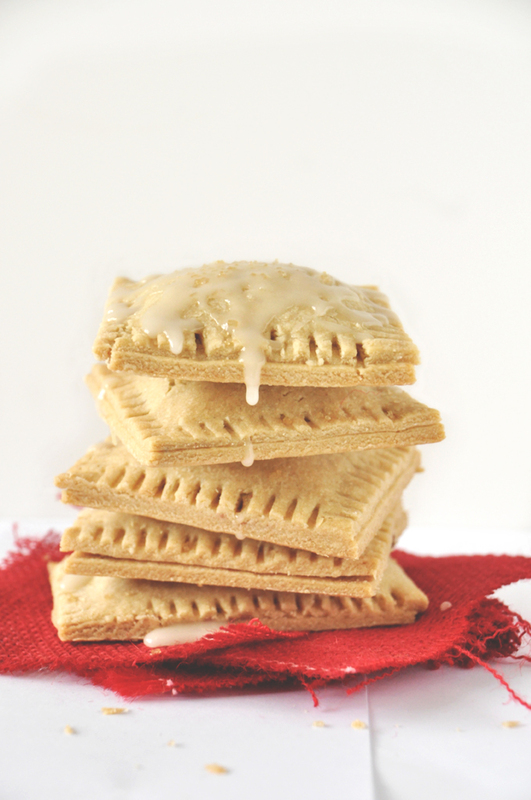 My husband LOVES poptarts so it would be a real treat if I made him homemade ones. Thanks so much for the recipe. Congrats on very inspirational blog award! 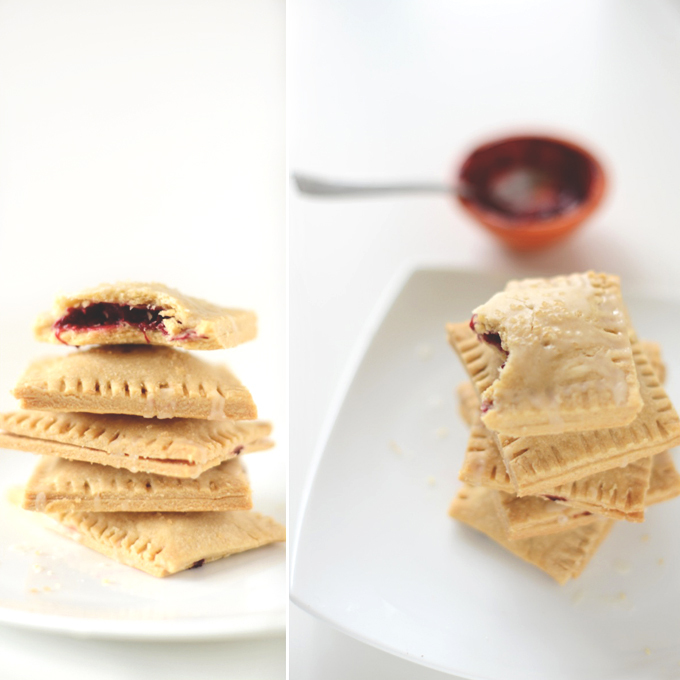 I’m definitely a follower :) I blogged about the poptarts and linked it back to ya on my page ! To be honest, I’m just impressed that you ate the fruit pop tarts for breakfast. I was chocolate all the way! I do miss that sensation of biting into the buttery pastry and burning your tongue on the molten filling. Definitely going to try these. hey ! I nominated you for an award. I love love love these!! Ah, pop tarts were a high school favorite, so these are perfect! This looks excellent! Loved your pop tarts…these look so crisp! Gah! Friend, and I call you friend because you make my life complete with these amazing recipes that keep coming. Friend, you have done it again! I am thinking that these would make the perfect Valentine breakfast for my teenage girls! They would be happy, I would be happy. It’s truly a win-win. Also, I want one really bad so it’s a good excuse! Tammy, you are the sweetest! Thanks! Oh man these look AWESOME! These look amazing! I’ll have to give them a try gluten-free. Thanks Dana! How would you make gluten free? girllllllllllllllllll..i was OBSESSED with poptarts growing up. they were always my breakfast of choice. my FAVORITE was the smores- chocolate, graham cracker, marshmallow heaven. blueberry was my “healthy” favorite, though ;) looking at the packages now, i’m horrified that my mother allowed me to eat such trash. but, of course, she didn’t know. i love your versions and that they seem quite simple to make. bravo! The compote could be strained to remove the seeds. I would do that is I were to make these. Yes, yes, yes! I will be making these. Maybe with nutella instead of berries or both or something. Yum! Delicious and Filling. The fruit compote makes the tart! This is my new favorite blog! I love everything you’re cranking out! Oh, YES. Love these bright photos!! And pop tarts definitely used to be a favorite of mine. Brown sugar/cinnamon was the clear winner, then cherry (with frosting! ), then strawberry, then chocolate. I’ve been meaning to tackle a GF pop tart but have been scared. I’m a little more motivated now! I’m a teacher and our school’s free breakfast of choice is Pop-Tarts. I stare longingly at my students’ breakfast every day (because I’m a wannabe vegan and healthy-ish person) so I’m super stoked to make these! Thank you!!!! I haven’t had a pop tart in years! Their scary ingredient list turned me away, but I’d love to try out a recipe with ingredients I know, like this one, and that’s vegan as well! These look amazing! 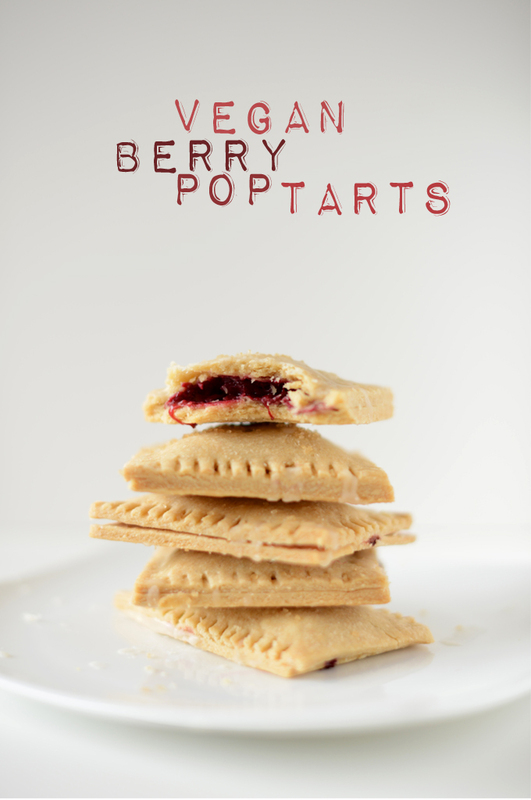 Justin and I were total fans of pop tarts during our pre vegan days, and you are right, it is just not the same without the glaze – I would actually dissect my pop tart and eat the top half (the glazed half) first :) Definitely making these asap! Gah, healthy pop tarts?? My life is complete. Super yum. I have been wanting to make some vegan pop tarts for a few months now after seeing a few recipes out in the interwebs – no excuses now! You recipe looks fantastic!